How should florists charge for rentals? When I asked florists what they most wanted to learn in the upcoming year, the #1 answer was “pricing”. One of the most frequent pricing questions I’ve received over the years is on rentals; precisely, “How do you charge for rentals?”….. Rentals can be a smart income stream for your business. If you find that your clients are most-interested in renting vs. buying centerpiece vessels, then offering items for rent is one way to fill a need for your clients. If you tend to work with clients who want to “own everything” and feel free to give flowers away at the end of the evening or re-use them for brunch, etc., then perhaps you don’t rent as many centerpiece containers, but you have some “other feature pieces” that you can rent over and over again. You must consider your storage space as well. For example, if you have to rent a storage unit, do you *really* need the expense involved in storing those rental items? Remember: Styles come and go. Don’t go “all-in” with something that’s not particularly versatile! Pro-tip: Sometimes rentals “walk away”. Make sure you have a clear rental agreement that covers a deposit for damage, loss, etc. Every contract requires a meeting of the minds; make sure your client knows how you will bill for lost or damaged items. Thanks for taking the time to tune in and watch. Do you need a pricing guide on your website? Click HERE to find out. Do customers think your prices are too low? Click HERE for more. Can you be professional without a storefront? It’s not always easy to work from home. But it’s not unprofessional to “not have a shop”. A shop doesn’t make you “more professional”. Your talent-level isn’t related to your workspace. If you create beautiful work and provide excellent customer service….from home, a small studio, or your basement or garage….don’t feel inferior due to a lack of storefront. How many people do you allow in a consultation? Do you prescreen clients with a phone consultation? Consultations are an investment of time and I like to start with a phone consultation. We can arrange an in-person meeting if we both feel we’re a good fit. 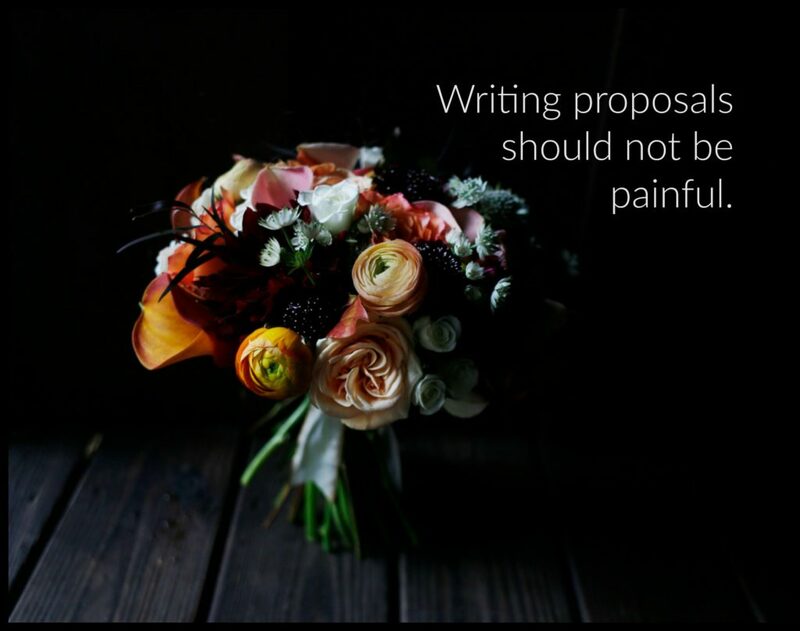 I can put together a quick proposal and quote after a consultation to get the ball rolling, make sure we’re on the same page; it’s essential to have a meeting of the minds. Have you signed up for my FREE e-mail course, How To Book More Weddings More Quickly? Check it out my FREE course HERE to get some of my best tips for booking more clients in less time. Thanks for stopping by and checking out some of my Real Flower Business “stuff” today! Keep doing beautiful work, floralpreneur. Find a full list of my course offerings HERE. Floralpreneurs were kind enough to share their feedback with me (thank you!) and in my last blog post I shared the #1 Thing florists told me they want to learn (you can read it here). Today I want to share Thing 2; the #2 Thing Florists Need To Learn based on the survey results I received. Thanks so much to all who took the time to share your thoughts with me! It really does help me to hear your input so that I can work to better tailor my course offerings and free content to meet your needs, struggles and wants. Everything I create is designed to help you better manage your successful and fulfilling small business. 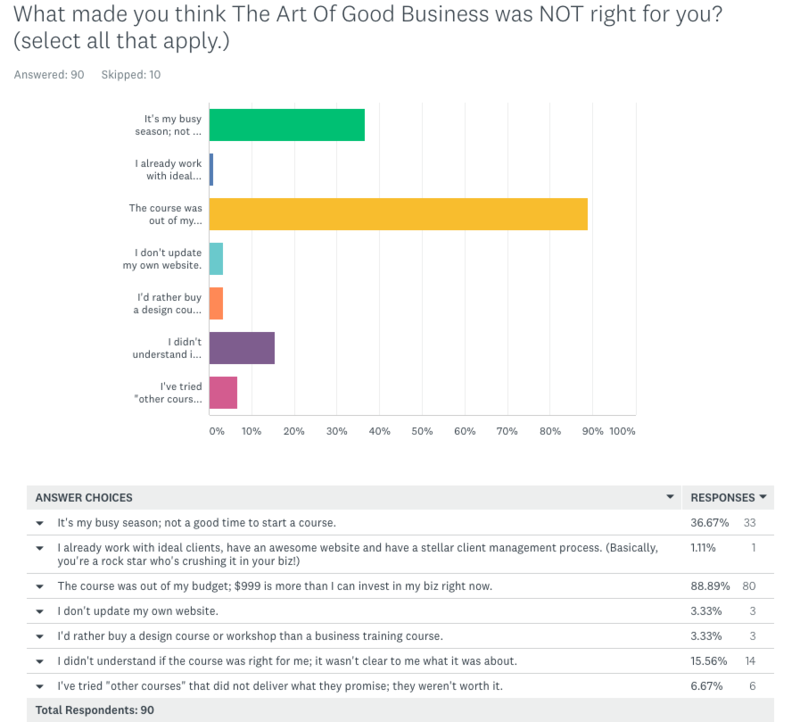 I asked: Do you feel confident that your brand is “as good as it can be”? I think every business owner can relate to these feelings….do I have a business or a brand?…what IS my voice?…I’m good at what I do, but I hate selling “me”. Good brands are built, not born. It takes time and practice to develop a brand that goes “beyond just a business”. The #2 Thing Florists Told Me They Want to Learn is “Website stuff”. Only 3% of respondents said they don’t update their own website! If “website stuff” is on your list of things to-do, then you will LOVE the Art of Good Business! I asked: What made you think the course was NOT right for you…click below to watch! However, only 1 florist said that she already works with her ideal clients, has an awesome website and a stellar client management process! If only 1% of respondents is reaching her ideal clients and crushing it with her business, then it seems to me that florists really do need The Art Of Good Business and the results you can create for yourself once you take action and join my course here. 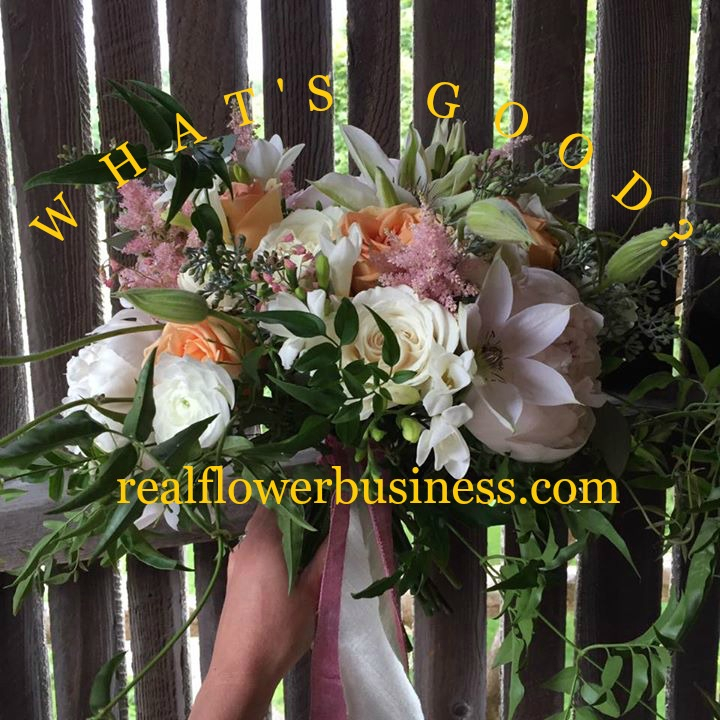 2 of most frequent answers as to why floralpreneurs did NOT sign up for The Art Of Good Business– #1. it was a busy time of year and #2, I was surprised to learn that most florists said they’d never taken an online course before. I’d like to address ALL of your concerns regarding time, cost and “busyness” and invite you to 3 new sessions of The Art Of Good Business starting in November, January or March. And because people mentioned price as the #1 roadblock, I’m introducing a 4-payment plan. Think about the investment like this: what it would mean if you booked JUST 1 MORE IDEAL CLIENT after taking my course?……Would you make back your investment in 1 gig? Would it be worth it? What if you booked 5 more ideal clients? Now, what if you consistently book more and more ideal clients every year from now on?…..what would that be worth? Whether you missed the boat for the October session or you simply didn’t think it was worth the investment, think about where you are NOW….and consider where you want to be next year….2 years from now….5 years from now……What steps are you going to take to get there? How are you going to transform your business into a long lasting brand? (I’ve spent almost $2k in online education in the past 3 months…at a time when I was “so busy” I knew I didn’t have time to fully absorb all the info, but I started anyway…and over the next few months I’ll be digging in.) I am not afraid to start before I’m ready….it’s the only reason I am where I am right now. Being too busy or not having $999 in your budget can be a totally valid reason to not sign up for my course and I understand the feeling–it took a long time for me to decide it was worth the risk to try to figure out how to have a business that was branded and excellent; I had to take a leap and invest in myself if I wanted to move on to the next level with my biz. I always felt like I had to do everything myself–for years–but I took my first leap on a conference in NYC with Marie Forleo & Danielle LaPorte called Selling Your Soul and I got so much value–so much inspiration–that I’ve been investing in my business education and development every year since. Don’t wait until “the time is right”…..the time is NEVER right. There is always a holiday, or another project, or an upcoming “big ticket item” that we have to plan for….think about what it would mean if you booked JUST 1 MORE IDEAL CLIENT this my course…….would you make back your investment? Would it be worth it? While most florists said that they had never taken an online course, of those who’ve taken online courses, over 6% of people had been disappointed in a previous online course they’d purchased. I’m sorry to hear that and I’ve been there, too. When Flower Math first came out in November 2015 I purchased another pricing course to see how it compared and I was really disappointed in what I saw. Frankly, it was marketed to floral designers, but it wasn’t nearly specific enough and did not properly represent the industry standards on pricing & profits. It was heavily marketed to florists and I bet a lot of business owners bought it and didn’t get their proper value. Bad courses happen. Your skepticism is warranted. But if you’ve been burned before, don’t give up hope! I’ve invested in several online courses (admittedly not wedding or floristry related; they were highly vetted business courses) and each of them has majorly helped me to push my business to the next level. Join the November session HERE. Registration is open Nov. 1-30. Class begins Nov. 6th. Doors Open for the next session Jan. 1-31. As always, you can contact me with any questions you may have! When I asked you what you’re most interested in learning or improving, the hands-down response was “Pricing and profitability”. This doesn’t surprise me. My very first course is Flower Math, The Florist’s Guide To Pricing & Profitability, which I created because I know that there are really talented florists out there who still don’t have a firm grasp on how to price their work. I know how important pricing and profits are to your small business. 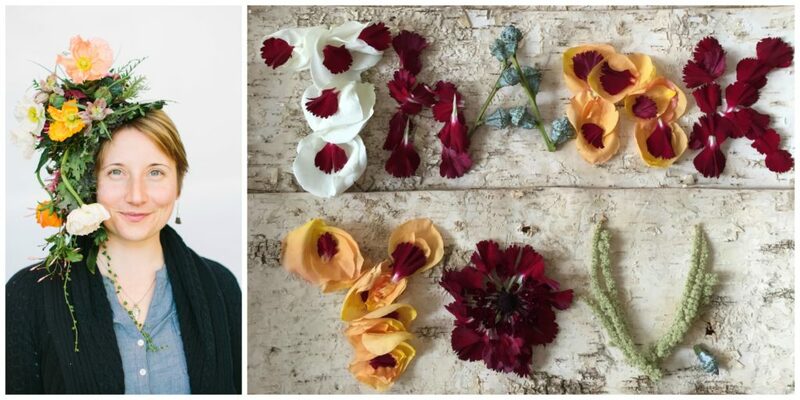 Since so many of you answered that this is what you’re most interested in learning or improving I’m introducing a 2-payment plan for Flower Math….you can start today if you’re ready. What’s Good In Your Business? What’s Good? I mean what is really good in your business right now? Are you crushing it in your design work this year? Are clients over-the-moon happy with your professionalism and attention to detail? What are people thanking you for lately? Acknowledge the things that are going well in your business; congratulate your employees if they’ve helped you get here! What’s happening in your business that you’re especially proud of? What progress have you made over the last year…or two…or ten? Every year I set a new goal. I identify an area with “room for improvement” and I get to work on that. A few years ago I made a decision to spend more time on boutonnieres and corsages. It’s an area I’d often leave until last and then rush through a bit as I just wanted to “get it done”. 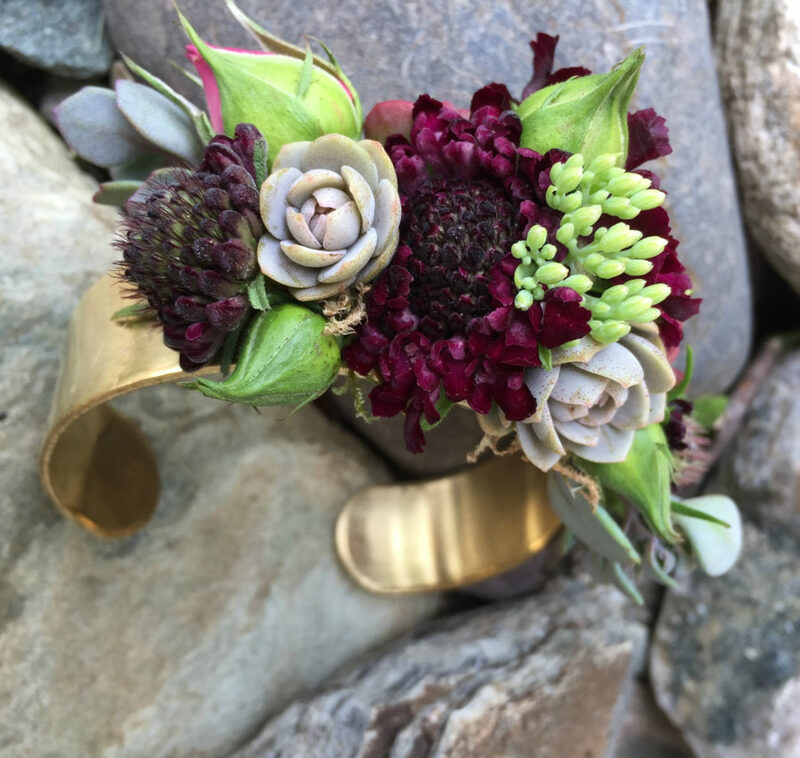 Once I made a serious effort to dedicate more care and patience into my bouts and corsage work, I was happier with the end product!…and now it’s just “the way I do it”. Each year’s resolution for improvement builds upon the last until the brand is stronger and stronger through practice and dedication to excellence in as many areas as humanly possible. As small business owners we cannot be perfect in all ways at all times, but we must continually set new goals and raise the bar for ourselves if we’re doing the work of a good brand. Here’s a floral bracelet I made late on a Friday night for a wedding on Saturday. Even though I’d had a long day, I kept my commitment to quality….because I’m the one who sets the standards. Hey, have you unlocked The Vault yet? Get it for only $13 here. Read more on setting standards for your work here! Find out about more Alison here. What’d you do this weekend? Work? Spend time with family or friends? I had a mix of both. but on Saturday I fell into a project I KNEW I had to tackle, but simply did not think I had the time for; I finally updated my testimonials page on my website. Sounds pretty B-O-R-I-N-G, I know, but reviewing testimonials is actually really fun. CLICK HERE to get the free pdf today. Once you get more testimonials, what will you do with them? Client testimonials can tell you a lot about yourself, your business, and your brand, but they also tell other customers exactly what they need to know about working with you. I also highly suggest you re-read your testimonials a couple of times every year, as well as any time you’re feeling “down” or find yourself “struggling in the off season”! A good read through of your testimonials and online reviews can be a great ego boost! Reflect on the good work you’ve done and get yourself pumped up to exceed those standards year after year. We can never stop learning and improving our customer service experience! Once you gather reviews from your clients, put them on your website! Use them! The reviews that describe what it was like to work with you most recently, can be powerful tools to add to your website. 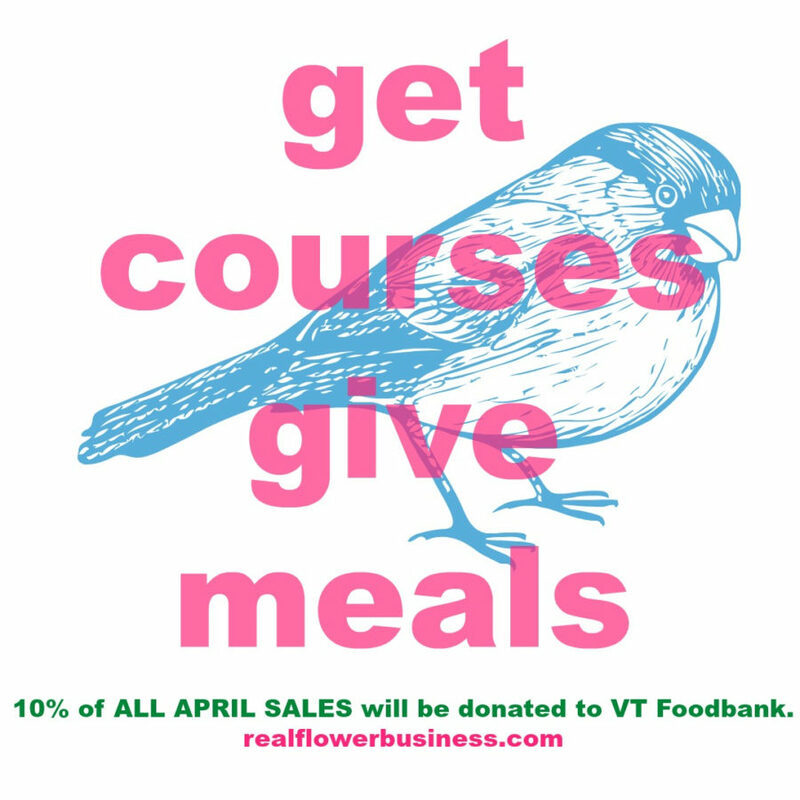 This April is about giving back! Every $1=3 meals, so even a little bit of giving goes a long way! Find my course offerings HERE! Oh, and have a look at my new Testimonials Page HERE to see what other florists have to say about my courses!